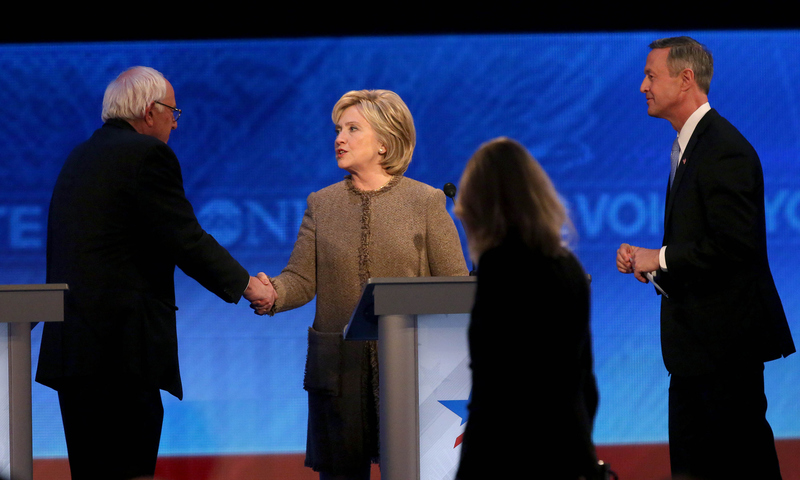 The third Democratic debate was primed to be an unmitigated disaster for the party. Just two days before it took place, a potentially major scandal erupted between Bernie Sanders, Hillary Clinton, and the Democratic National Committee, and this could have resulted in an angry, accusatory debate that painted all of the candidates in a bad light. But instead, the Democratic candidates stuck together, and in doing so, they all dodged a bullet. To sum up a complicated and boring scandal, members of Sanders’ campaign staff allegedly exploited a software glitch and used it access some of Clinton’s voter data. The DNC responded by cutting off Sanders’ access to the national party’s voter information — a serious blow to Sanders’ campaign — and this prompted Sanders to sue the DNC. Cumulatively, this made just about everybody — Sanders, Clinton and the party itself — look vindictive, petty, and unethical. Sanders received the first question at the debate, and not surprisingly, it was about the data breach. At first, it looked like things would devolve into a slugfest: Sanders criticized the DNC, then implicitly criticized Clinton’s campaign for going to the media when the breach became apparent. He even suggested that some of his campaign’s voter data might have ended up in Clinton’s hands. But then, Sanders was asked if Clinton deserved an apology, and the entire mood on stage turned on a dime. Apparently, that was all it took. When Clinton was asked to respond, she did so with magnanimity and grace, refusing to criticize either Sanders or the DNC and asking everybody to move on. And that was it. Clinton refused to criticize Sanders at all — saying only that her campaign was “distressed” when the data breach became apparent — and basically brushed it off as a non-issue. If anybody was in a position to make an issue out of this, it was Clinton — and she didn’t. The crowd applauded. Sanders said that he agreed, and that was it. To get an idea of how important this detente was, consider the way things could have gone. Suppose Sanders had refused to apologize to Clinton — “these were the actions of my staff, not me,” that sort of thing. Imagine if Clinton had refused to accept Sanders’ apology, and instead questioned the integrity of his character — “a man running for the highest office in the land shouldn’t resort to theft and trickery,” etc etc. Things would have gotten very messy, very quickly. The likely result of this would be that Sanders’ and Clinton’s supporters would turn viciously against each other — more so than they already are, at least — and that would make it much more difficult for the eventual nominee to unify the party and get out the vote in the general election. It would have also blunted one of the Democrats major arguments to swing voters, which is that they’re the adults and the Republicans are the children. But that didn’t happen. In all likelihood, everybody on stage knew exactly what was at stake here. They were well aware that an angry, vicious argument about whether the candidates were acting ethically would have made everybody look bad. And that’s bad for the party as a whole. What’s more, all three candidates went out of their way to draw a contrast between the Democratic field as a whole and the Republican Party. It’s not a surprise that Clinton did this — she’s the front-runner, and she’s preparing for the general election. But it was unexpected that Sanders, and especially O’Malley, focused at least some of their ire on the Republicans. That, too, bolsters the argument that Democrats nationwide will be making once the eventual nominee is decided upon. Lastly, the DNC deserves a bit of credit here as well. The morning of the debate, it announced that it would be restoring Sanders’ access to its voter files, a big gesture of goodwill may have helped calm tensions on the stage later that night. The data breach controversy will continue to play out over the next several weeks or months; there’s still an independent inquiry pending, and its findings will surely make headlines once they’re public. But by and large, this scandal is over. The Democrats’ better political instincts won out on Saturday night. DataGate has been neutralized as a campaign issue, and a scandal that could have been a serious impediment to Democratic unity in 2016 has more or less evaporated.